NEW DELHI, Sept 5  The 26-day old nation-wide strike by university and college teachers was called off tonight following negotiations with the government on their demands for implementation of UGC recommended pay scales, it was officially announced. 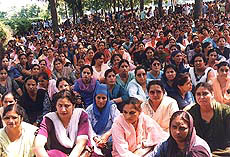 Government school teachers observe September 5 as "black day" following the suspension of three of their colleagues in Chandigarh on Saturday. NEW DELHI, Sept 5  Prime Minister, Atal Behari Vajpayee, today said Delhi was ready to discuss all issues, including J&K, with Islamabad following "forward movement" between India and Pakistan in Durban. PACHMARHI (MP), Sept 5  After two sessions of intense debate, the Congress delegates sensed the mood of the party leadership and virtually rejected alliances as the route to regaining power. TEHERAN, Sept 5  Irans state radio said today that Iran had the right under international law to take all necessary action against the Afghan Taliban, which it accuses of holding Iranian diplomats. NEW DELHI, Sept 5  The high-powered four-member group of secretaries has cleared the proposal for permitting the armed forces personnel to vote by proxy. AMRITSAR, Sept 5  Efforts of Mr Gurcharan Singh Tohra, president, SGPC, today received a setback when the Akal Federation questioned the authority of the committee to mediate between the Jathedars for an amicable solution to the stalemate. Bhai Narain Singh, president of the federation, said that the mediation effort by the SPGC was not as per Sikh tradition.